For picking up your PCB easily and do not mix it up with other customers' PCB, JLCPCB will add a very small Customer ID to your PCB and the number will be added by random, the number may be under some IC, if you solder the PCB, it will be hidden. But if you want to put it in a specific location, that's ok as long as you indicate in your file. 1. You can indicate this location by adding the text of "JLCJLCJLCJLC" to silk layer, and then make a note about it when you place your order so that we notice it, or it maybe missed easily. Note: Just "JLCJLCJLCJLC", No more or less characters. The font size should be larger than 0.8mm in height and 0.15 mm in width. 2. 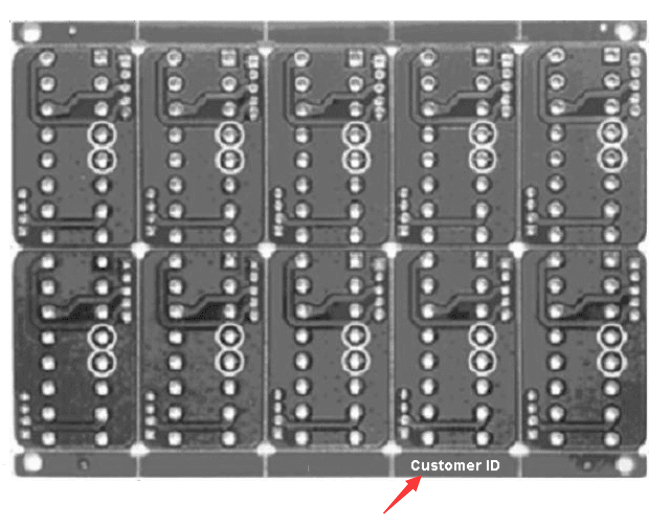 If you don't like it, when you place your order, you can choose Panel by JLCPCB https://support.jlcpcb.com/article/24-how-do-i-order-a-panel, we will add the string at the dirty edge by default, so there is no string on your product PCB.